We’re ‘Bloem’ing in Bloem! 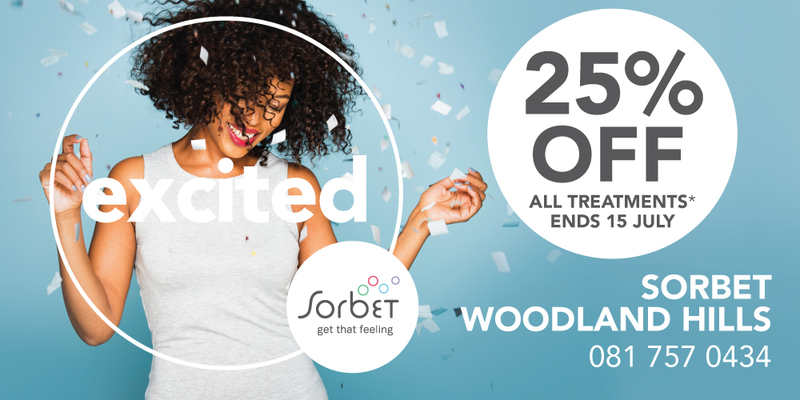 – Sorbet Woodland Hills is now open! Guess what? – We’ve opened our 2nd store in Bloemfontein! Woodland Hills is now open! 25% off ALL treatments! 15th June – 15 July ’16! Call 081 7570434 to make your booking! Offer valid from 15th June 2016 to 15 July 2016 at Sorbet Woodland Hills only. Discount only applicable on treatments and excludes all retail products and gift vouchers. Sorbet reserves the right to cancel this promotion at any time.